This is another photograph from a wonderful wedding in Buxton, Derbyshire. 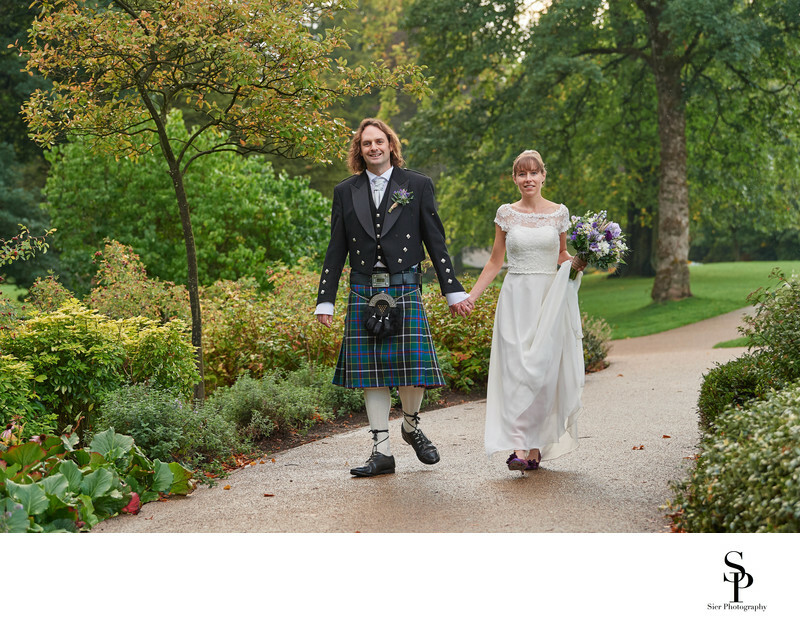 This image of our bride and groom was taken as they walked together in the Pavilion Gardens following their wedding at the Old Hall Hotel in the centre of Buxton. The Pavilion Gardens are some simply stunning gardens reminiscent of the Sheffield Botanical Gardens and are equally as well kept but more along the lines of a park than a traditional botanic garden. As wedding photographers, we love to go and visit and photograph somewhere new, especially when the wedding is as fantastic as this one was. It is also interesting to see different wedding dresses and the changing style of suits as time marches along. This wedding was a little different in this regard with the groom, best man and groomsmen all wearing kilts. The kilts worn were a little different too as these weren’t the traditional Scottish kilts but a Cornish Kilts, something I'd not come across before this wedding though to my untrained eye it looked very similar to its Scottish cousin. We really enjoyed working at the Old Hall Hotel at this wedding, as already mentioned, it is a real treat to explore somewhere new and we love to meet new people on these happy days as families and friends come together to celebrate the joining of two families through marriage, hopefully we will have the chance to work here again and it might even be sunny all day instead of just at the end. 1/200; f/4.0; ISO 800; 90.0 mm.